The mandate of the Fraser Valley Committee is to provide Mainland wineries and growers with workshops pertinent to their growing area. Mary McDermott is Chair of the Committee. Please contact Kate Durisek, info@bcwgc.org for more information or check our Events page for upcoming workshops planned for the Fraser Valley. 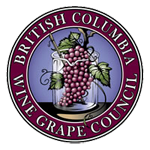 Mandate: To work with BC winegrowing areas outside of the Okanagan / Similkameen area to determine workshops pertinent to their growing area. Log in or create an account to subscribe to this page and receive email notifications when it's updated.